"Oh, Zazu, do lighten up. Sing something with a little...bounce in it." "No! No! Anything but that!" For a few years, my eye has been fixed on Maine as a flying destination. During a visit to Groton, CT, my friend Brian told me about the Owls Head Transportation Museum on the field at Knox County Regional Airport (KRKD) in Rockland. From that chance inspiration, one adventure begat another. 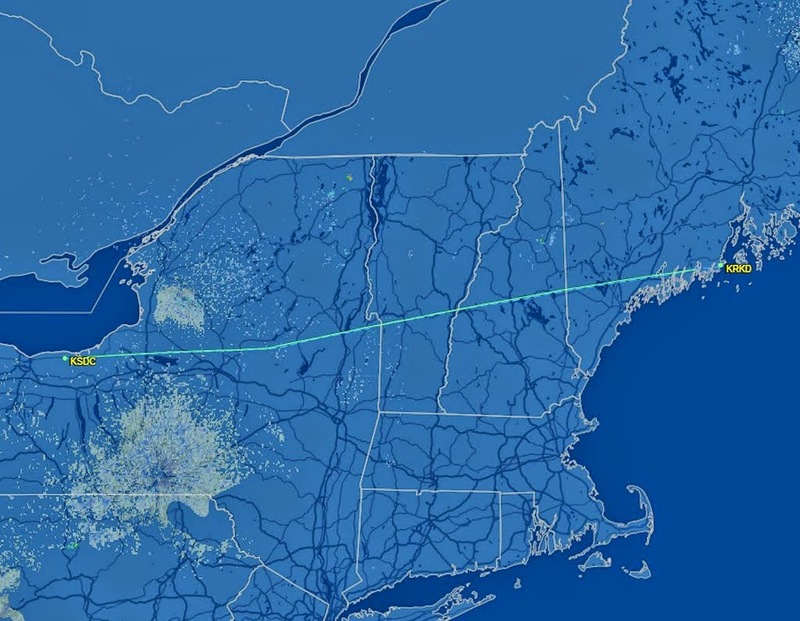 I departed solo from the Williamson-Sodus Airport at 8:00 am on an IFR flight plan to Rockland, Maine via GFL (the Glens Falls VOR) and GRUMP intersection (just south of the Laconia Airport in New Hampshire, my previous easternmost point of landing). The route was devised to avoid military operations areas (MOAs) southwest of the Adirondack Mountains in New York and over the White Mountains in New Hampshire. Cruising east at 7,000 feet, I flew over patches of isolated fog still clinging to waterways below. West of the Adirondack Mountains, low cloud cover obscured much of the terrain. Through occasional breaks, I caught glimpses of civilization surrounded by rust colored foliage in a post-peak autumnal tableau. Sadly, I was about two weeks too late to see peak color on this flight. As I passed Piseco Lake, the familiar Piseco Airport was obscured by localized clouds (above). I realized that I would need to travel east another hour before leaving familiar territory. When I first moved to New York, it seemed as though there were limitless places to explore by air. Now, almost nine years later, I find myself ranging ever farther away from home to find new places. Just west of Lake George (above), Boston Center offered me direct to Rockland. I took it. There were still swaths of color on higher terrain near Lake George that were not yet entirely turned to rust. Over Vermont, roughly halfway to my destination, nature came calling with breathtaking urgency and I knew that I would not make it all the way to Maine without taking action. My options were to either divert, land, and lose significant time at my destination or...improvise. I successfully accomplished the latter, my first attempt at such a feat in twelve years of flying, and I did it while hand flying the airplane to IFR standards. Sure, it was awkward when Boston Center instructed me to climb 1000 feet to mitigate a traffic conflict, but just think of all the time that I saved! Over the White Mountains of New Hampshire (above), I experienced some mild mountain wave action. I held altitude well, but my airspeed visibly fluctuated as I kept the altimeter needle pegged with gentle fore and aft pressure on the controls. Back at my original cruise altitude of 7,000 feet, the cloud deck slowly rose toward me. Though the Warrior's wheels may have dragged through the highest bits of mist, I never actually entered the clouds. 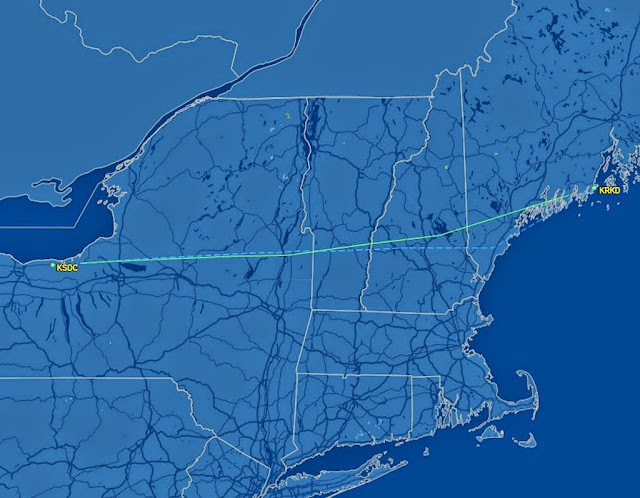 Once past Lake Winnipesaukee, I found myself farther east than I had ever flown before. Beyond the White Mountains, I entered Maine. Terrain visibly flattened and, in the absence of orographic lifting force, the cloud cover vanished. Downwind of the mountains, however, the wave activity persisted until I was well east of Sebago Lake (above). The Songo River formed an eye-catching delta where it joined Sebago Lake. On my first inspection of the sectional chart, I was struck by the tattered appearance of the Maine coast; ragged and rocky islands stretching out to sea, all aligned in a southwesterly direction that hinted at the geological forces that formed them. In kind, the Atlantic made numerous brackish incursions onto the continent. Within fifteen miles of Rockland, I cancelled IFR with Portland Approach and explored the many rugged islands of Muscongus Bay. I was not disappointed by the view. Knox County Regional Airport has published an extensive noise abatement procedure covering different types of aircraft (propeller versus turbine driven) approaching and departing all four runways. In addition to complying with the procedure, I chose to fly a wide pattern that kept me largely off-shore for my approach and landing on runway 31. I made my way to Downeast Air, submitted a fuel order, and was offered the use of a Toyota RAV4 to get lunch in Owls Head. Downtown Owls Head appears to consist of little more than a post office and the Owls Head General Store. A sign outside the latter proclaimed "Maine's Best Burger" on the authority of the Food Network. I did not fly all the way to Maine for a hamburger, though. As I scanned the chalkboard menu, I fixated on the Maine Crab Roll. What was presented to me was more feast than mere sandwich. There appeared to be nearly a pound of chilled, shredded crab meat piled high on a tasty roll so hot from the oven that it stung my fingers to handle it. I enjoyed every bite, though there was so much crab that I struggled to finish the whole thing; such struggles are rare for me. Before returning to the airport, I made a brief side trip to the tip of the peninsula and visited the Owls Head Lighthouse. According to a plaque mounted nearby, the facility was first illuminated September 10, 1825. Though modest in stature, the lighthouse stands on a precipice with a commanding view of the ocean. Back at Downeast Air, I called the Owls Head Transportation Museum for a ride. Although there is nothing stopping an itinerant aircraft from parking on museum grounds, the museum does not encourage this. My driver that afternoon was Bob. Bob runs the aircraft restoration and maintenance facility and also flies several of the "Golden Age" era aircraft in the museum's collection in what has to be the coolest retirement job ever conceived. On the short drive to the museum, I learned that Bob originally hails from Rochester and is very well acquainted with Ray, my good friend and owner of the Le Roy Airport. In fact, he noted that he was heading to Le Roy soon because the museum's Curtiss Jenny was due for an engine overhaul. There is a shop in Le Roy that specializes in race car engines and, as it turns out, Curtiss OX-5s. This was news to me, but I happen to know the owner of the shop because he is another tenant at the Le Roy Airport. Frankly, I was thrilled with this "small world" moment; the world can be an amazing place in its mundane reality. While airplanes make the world a smaller place by virtue of their capabilities, aviators do so by being so few in number. I spent three very enjoyable hours at this top-notch museum (photos will appear in a different post), including time in the restoration hangar listening to some of Bob's stories. As might be imagined considering his experience, Bob has some terrific stories. On departure, I chose to return VFR with flight following at 6,500 feet. Because I was VFR, I chose the reciprocal of my original IFR routing to avoid special use airspace: KRKD - GRUMP - GFL - KSDC. At cruise altitude, I was over a haze layer. The late afternoon sun reflected brilliantly off the surface of the ocean along Maine's tattered coast. I returned to more familiar places as I passed GRUMP intersection over Lake Winnipesaukee. Immediately to the south was the Gunstock Ski Area, the runs already in deep shadow from the westerly sunlight. I crossed the Connecticut River from New Hampshire to Vermont, haze and low sun conspiring to spread diffuse shadows among the mountains. Relief from the sun came courtesy of a conveniently positioned cloud as I approached Syracuse from the east. As the sun set, a phoenix appeared to the south - an isolated cloud burning with the light of day's end. Sodus Bay came into view as the sun finally stole away behind the edge of the world. 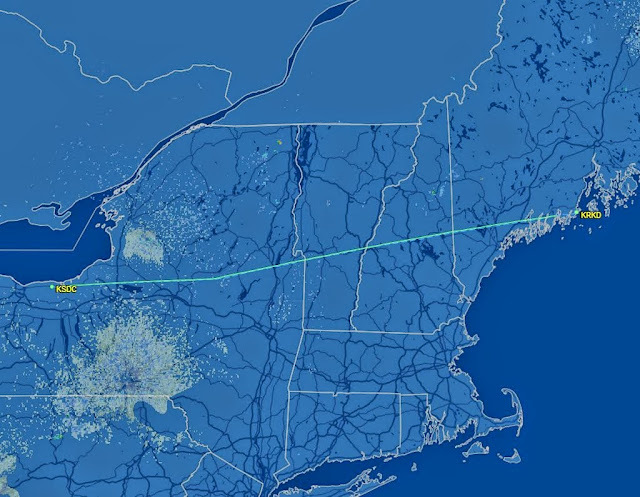 FlightAware track from Rockland to GRUMP, then GFL, then Sodus. I have no idea where ATC conjured the depicted "filed" routing from. In the end, I was pleased with my solo excursion to Maine and my visit to the wonderful Owls Head Transportation Museum. Though I arrived home late, that incredible Maine Crab Roll sustained me for the rest of the day. I had visited a new airport in a new state, met an accomplished member of my extended aviation clan, saw some beautiful sights, and established a new easternmost point of landing on the map.